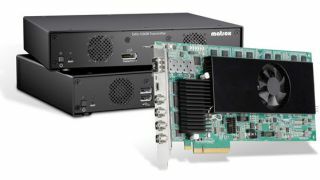 The What: Matrox Graphics (booth 1973) will debut a new line of IP KVM products, Matrox Extio 3 Series, featuring both quad- (Extio N3408) and dual-video (Extio N3208) models, at InfoComm 2017. The What Else: Extio 3 securely extends a single 4Kp60 4:4:4 video signal—or four 1080p60 4:4:4 signals—along with keyboard, mouse, stereo audio, and USB 2.0 over standard gigabit Ethernet at low bit rates. Extio 3 IP KVM products deliver remote desktop performance, and when combined with standard GigE network switches, creates an over-IP extension and switching solution, allowing users to switch to any system on the KVM network. Designed to optimize collaboration, Extio 3 provides a secondary H.264 proxy video stream, compatible with H.264 software and hardware decoders, enabling users to view a selected desktop on mobile devices, record it to a network attached storage, or to display it on a video wall. The Bottom Line: Extio 3 provides the operational flexibility required for use in industrial automation and process control, healthcare, transportation, defense, government, broadcast, and production industries and applications. Configurable as a point-to-point or networked KVM, it allows the centralizing of hardware in climate-controlled server rooms, increasing security, protecting against environmental hazards, and reducing system noise and heat emissions.